Barbara Fradkin (n,e Currie) was born in Montreal and attended McGill and the Universities of Toronto and Ottawa, where she obtained her PhD in clinical psychology. Her work as a child psychologist provides ample inspiration for plotting murders, and she recently retired from practice to spend more time with her pen and her fertile imagination. Her dark short stories haunt numerous magazines and anthologies, including Storyteller Magazine, and the Ladies Killing Circle and New Canadian Noir anthologies. However, she is best known for her award-winning detective series, featuring the exasperating, quixotic Ottawa Police Inspector Michael Green whose passion for justice and love of the hunt often interferes with family, friends, and police protocol. 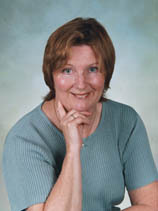 An active member of Canada's writing community, Barbara served as president of Crime Writers of Canada (2004−2005). She lives in Ottawa and is currently working on the seventh novel in the Inspector Green series. Nominated, Arthur Ellis Award for Best Short Story, 2007, for "Voices from the Deep"